Back in 2012, the Angels were in a playoff hunt thanks to strong veteran seasons from pre-decline Albert Pujols (4 WAR), post-decline Torii Hunter (5.4 WAR), and a break-out rookie named Mike Trout (10.5 WAR). What they wanted was an ace pitcher to shore-up their rotation. What they didn’t have a lot of was minor league talent. As a result, the Angels traded up-and-coming shortstop Jean Segura to the Brewers as a package to land Zack Greinke from the Brewers. The Angels failed to make the playoffs, Greinke headed to free agency, and landed with the Dodgers where he broke his collarbone, pitched in some playoff games, and nearly won a Cy Young. Imagine Zack Greinke’s surprise after he landed a record-breaking AAV with Arizona during the 2016-17 off-season, only to find Jean Segura, the shortstop valuable enough to land Greinke in his 2012 trade, backing him up at shortstop in Arizona in 2017 (that’s over 1700 miles away and 5 years later). That relationship lasted only a season, though. In the 2017-18 off-season, the Diamondbacks wanted a young controllable pitcher. What they didn’t have was a lot of young talent that they wanted to give up. As a result, the Diamondbacks traded Segura, coming off a career high 122 OPS+, to the Mariners for post-hype Taijuan Walker (once a top pitching prospect) and Ketel Marte. This off-season, the Mariners have traded Segura, and other players, to the Phillies for shortstop J.P. Crawford, and other players. Then, they flipped one of the other players, Carlos Santana, in a 3-team trade. 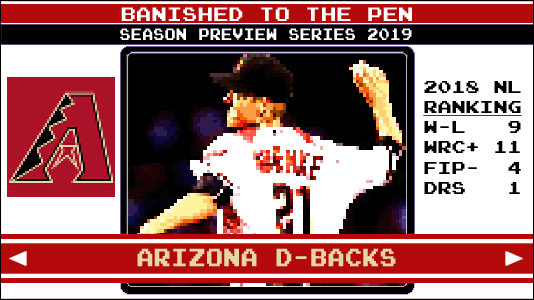 What does this have to do with the 2019 Diamondbacks? I’m not sure. The editors limited my Ketel Marte comments to a few sentences and I think the trade tree that, ultimately, also involves Marte is one of the most Effectively Wild things about the team. This trade tree impacts 18 teams and has yet to be settled, as Seattle acquired a 2019 competitive balance round pick as a result of the 3-team trade. Don’t count Jerry Dipoto out of this equation, as he still has the right to trade that pick. What is the Diamondbacks’ most recent accomplishment? Successfully traded one the greatest homegrown players in franchise history for 2 former top 100 prospects (catcher Carson Kelly and pitcher Luke Weaver) and an infielder with MLB upside (Andy Young). How will the Diamondbacks define success in 2019? Finish above .500. Steps forward for young players like Lamb, Marte, and Kelly. Saturday, May 18, 20,000 fans will receive a Randy Johnson Starting Lineup figurine to commemorate the 15th anniversary of The Big Unit’s perfect game. Everybody already has every bobblehead so why not pick up something that won’t break the next time you move?